Water cutting, also known as water knife, that is, high-pressure water jet cutting technology, is a use of high-pressure water cutting machine. Under the control of the computer can be arbitrary carving parts, but also by the material texture of small. Because of its low cost, easy operation, high yield, water cutting is gradually becoming the mainstream of industrial cutting technology cutting. To sand to the situation: water cutting is divided into sand-free cutting and sand cutting two ways. To equipment to points: divided into large water cutting machine, a small water cutting machine, three-dimensional water cutting machine, dynamic water cutting machine. To pressure to points: divided into high pressure and low pressure type, generally 100MPa for the boundaries. 100MPa or more for the high-pressure type, 100MPa below the low-pressure type. And 200MPa or more for the ultra-high pressure type. To the principle of technology to points: divided into front and rear mixed. To safety cutting points: divided into safe cutting and non-safe cutting category, the difference between the main above the water pressure, 100MPa below the low-pressure water cutting can be applied to special industries such as: dangerous, oil, coal, hazardous materials and other aspects. After a large number of experiments found that when the water pressure exceeds a certain threshold, even if the water will be some sensitive chemicals detonated, and sand water cut due to the water containing abrasive sand, sand potential energy and impact and object collision, Of the energy will also cause the instability of special chemicals, after a lot of experiments and arguments, and finally reached the threshold at 237.6MPa or so. Therefore, in the water cutting industry, people more than 200MPa water cutting is mainly used in the machining industry. 10,24 hours of continuous work. Water cutting as a new technology and new products, because of its mechanical products, no electronic products, technical mystery and sense of technology so strong, has not been the media attention, until 2011, due to water jet expert Ji Xincang creative another way, The water cut made into a miniaturization, security, so that the water cut can not change the use of security in the situation. This basic principle is both simple and complex. The water jet starts from the pressurized pump, passes through the high pressure pipe, and then emerges from the cutting nozzle. Very simple explanation. However, it is a very complex design, in order to produce the pressure of 60000PSI. In the design process, there are small leaks will cause damage to the parts lasting damage. So manufacturers and engineers will be careful to deal with high-pressure materials processing technology, the use of special technology to combine this machine. Users only need to know the basic operational knowledge. Cutting machine used in the industry in 1982, the earliest appeared in 1970, in the industry is mainly used in the automotive, aviation, glass industry, from these cutting continue to improve accuracy. The pressure of the abrasive cutting machine can reach 55,000 PSI, which is ejected at a speed of 762 m / s through a small nozzle, which is 2.5 times the speed of sound. The pomegranate sand is mixed into this high-speed water jet by mixing in the mixing tube and then directly from the sand pipe at a speed of 305 m / s to the material being processed. This cutting process is a kind of grinding Of the process, this power and action are produced by the water. Dr. Norman Franz has been recognized as the father of the water knife. He is the first person to study ultrahigh pressure (UHP) waterjet cutting tools. The definition of ultrahigh pressure is higher than 30000 psi. Dr. Franz is a forestry engineer who wants to find a new way to cut the trunk into wood. In 1950, Franz first put heavy heavy objects on the water column, forcing the water through a small nozzle. He obtained a brief high-pressure jet (many times over the current pressure), and was able to cut wood and other materials. His later studies involved more continuous water flow, but he found it very difficult to obtain continuous high pressure. At the same time, the life of the parts is also calculated in minutes, rather than today’s weeks or months. Dr. Franz never made a mass production of wood cutters. Today, cutting wood is one of the least important applications of ultra high pressure technology. But Dr. Franz proved that the high-speed converging water flow has a great deal of cutting energy – the application of this energy goes far beyond Dr. Franz’s dream. In 1979, Dr. Mohamed Hashish worked at the Fulu Laboratories and began to study ways to increase the energy of the waterjet to cut metal and other hard materials. Dr. Hashish was recognized as the father of the sandwiches, and he invented the method of adding sand to ordinary water jaws. He used garnet (a kind of material commonly used on sandpaper) as sand. 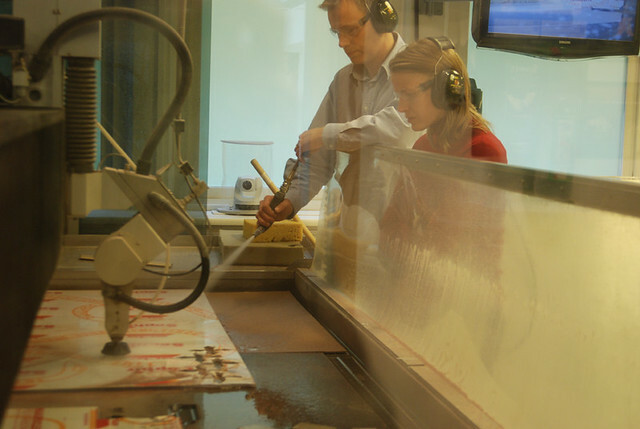 With this method, the water jet (containing sand) can cut almost any material. In 1980, the sand was used for cutting metal, glass and concrete for the first time. 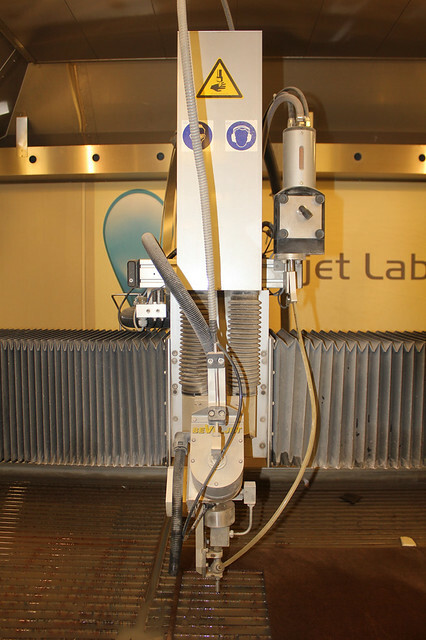 In 1983, the world’s first commercialized sandjet waterjet cutting system came out and was used to cut car glass. The first batch of technology is the aerospace industry, they found that waterjet is cutting military aircraft used in stainless steel, titanium and high-strength light synthetic materials and carbon fiber composite materials, the ideal tool (used for civil aircraft). Since then, the sandjet has been adopted by many other industries, such as processing plants, stone, tiles, glass, jet engines, construction, nuclear industry, shipyards and so on. In the early 21st century, portable water cutting technology came into being in view of the related problems and technical simplicity of water cutting technology in market application. Portable water cutting technology is a low-pressure water jet technology, that is, the use of lower pressure (25 Mpa ~ 50Mpa) can be achieved metal and other materials cutting operations. The emergence of the technology has a strong practical significance. The birth of portable water cutting technology for the development of water cutting technology has opened a historic page, is the water cutting technology in the field of another new breakthrough, marking the water cutting technology into the portable water cutting technology research stage. Portable water cutting technology draws on the basic principles of water cutting technology, aside from the traditional water cutting technology after the principle of mixed cutting technology and technological innovation and innovation. The technology is mainly used in the destruction of dangerous goods such as ammunition, with the portable water cutting technology continues to improve its application areas are also one step to expand, mainly used in EOD, petrochemical, coal mine operations, construction, ship Manufacturing and other related industries. You can cut most of the material, such as: metal, marble, glass and so on. Smooth cut, does not produce rough, burr edge. This machine uses water and sand cutting, this sand in the processing process will not produce gas, can be directly discharged, more environmentally friendly. You do not need to replace the cutting machine device, a nozzle can be processed different types of materials and shapes, saving costs and time. The program is mainly generated by CAD drawing software, you can freely design the line diagram in the layout, or input from other software generated DXF file, in addition, the machine supports third-party software, such as nesting nesting software (for graphics in Fill in the workpiece, to minimize the loss of the workpiece). Can be transferred to the machine by other software programs, it can be established from the CAD tool path, and the tip of the precise positioning and cutting speed of more than 2,000 points / inch (800 points / cm) calculated, you need to do Just specify the material you want to cut and the thickness of the other work to the machine to complete. 9, combined with other devices, can be operated separately. The water cutting machine can be combined with other processing equipment (such as drilling head), make full use of its performance, optimize the use of materials. The workpiece only need a small side pressure can be fixed, to reduce the complexity of the trouble brought about by the folder. 11, no cutting direction of the restrictions → to complete a variety of different cutting shape. 12, the resulting lateral and vertical force is minimal → can reduce the set time and the cost of using fixture. 13, with the same machine to complete the drilling and cutting function → can reduce the process time and cutting costs. 14, does not produce thermal effects or deformation or subtle cracks → no secondary processing, can save time and manufacturing costs. 15, does not produce toxic gases → can provide a better working environment for the operator. 16, will not produce burr → can reduce the time required to manufacture the workpiece and manufacturing costs. 17, slit fine → can reduce the production of a large number of waste materials, saving direct manufacturing costs. 18, once to complete the cutting of the workpiece and have a good trimming quality → can reduce the process time and cost. 19, according to the design and the workpiece material to make the flexibility of the adjustment → can be shortened from the order to the finished product output time, enhance your capacity for your business to bring more business opportunities. Due to the role of energy gradient, laser, gas plasma, jet and other cutting means in the depth of the cut (the farther away from the nozzle), cutting capacity worse, so the formation of the cutting surface is often not perpendicular to the workpiece surface, known as cutting The slope, which is an inherent defect for all cutting means. Although the cutting slope can be partially reduced by increasing the cutting energy or reducing the cutting speed, there is still a problem that the vertical cutting can not be performed completely. Thus, the idea of ​​tiltable cutting head was introduced in 1997, there are commercial products in the world, which is to solve the cutting slope, improve the accuracy of the most direct and effective method. The principle is through the original three-axis platform on the basis of the addition of two rotating shaft, the head can swing in any direction, and the use of pre-set in the system slope model, through the cutting track real-time calculation, The workpiece material and the thickness of the correction, in the process of cutting the cutting of the cutting head constantly, making the cut out of the workpiece to achieve a perfect no slope state. Usually the water cutting equipment is very large, generally for the machine type, small water cutting refers to the weight of less than 200 kg of water cutting equipment. Intelligent portable water cutting system, is an abrasive pulsed jet cutting system, using a unique design ideas, a breakthrough to reduce the overall size and weight of the water cutting system, the real realization of a single portable device requirements, greatly reducing the use of the overall Cost, for the wide application of water cutting technology to create a new idea. Portable water cutting system is the only cold cutting equipment, but also high-risk operations in the field of the best cutting equipment, can be widely used in public security, waste ammunition destruction, aviation rescue, armed police, oil industry, tunnel construction and rescue and other fields. At the same time, water cutting equipment fast, non-destructive, fine operation, one-time molding characteristics, can also be widely used in construction, equipment processing, stone processing, metallurgy, medicine and other fields. Ultra-high pressure waterjet can cut all kinds of thick, hard materials: such as stainless steel, aluminum, copper, steel, marble, alloy metal, glass, plastic, ceramic, tile and a variety of materials can be seen. The precision of the cutting workpiece is between 0.1mm and 0.25mm. The accuracy of the workpiece depends on the accuracy of the machine, cutting the size and thickness of the workpiece. Depending on the thickness of the working material and the nozzle used. In general, the cut of the sand is about 1.0 mm to 1.2 mm. With the diameter of the sand tube pipe flaring, the greater the incision. The cutting speed determines the bevel quality. Most of the tangential qualities of the cut-out are about 0.1 mm. In general, the complex pattern, thick, difficult to cut, fragile and afraid of hot materials, the most suitable for the use of waterjet cutting for processing equipment. LMC Laser Services Australia distributor of laser cutting, waterjet cutting, bending, LMC Laser. Spark & Co Machine Tools Inc Canada distributor of EDM, waterjet cutting machines, band saws. Machitech Automation Canada manufacturer of plasma cutting machines, laser cutting machines, waterjet cutting machines, beam cutting machines, robotics & automation, accessories. Bystronic Maschinenbau GmbH Germany bending laser cutting waterjet cutting. Bystronic Laser AG Switzerland manufacturer of laser cutting machines, press brakes, waterjet cutting equipment, automation systems. L.G.M Engineering UK manufacturer of waterjet cutting, sheet metal and structural fabrication. MultiCam Inc. US manufacturer of CNC router, CNC knife cutting machines, plasma cutting machines, waterjet cutting machines, laser cutting machines, robot sliders. Hypertherm US manufacturer of cutting equipment: handheld plasma cutting device, laser cutting machines, waterjuet cutting machines, controls, CAD/CAM nesting software, torches, consumables, etc. FLOW WATERJETS US manufacturer of waterjet cutting machines, waterjet surface preparation equipment. KMT Waterjet Systems Inc. US manufacturer of extremely high pressure waterjet cutting machines, waterjet surface preparation equipment. KMT Robotic Solutions, Inc. US US manufacturer of automated trimming and material removing systems for plastics, automotive, construction, marine industries, products include waterjet cutting machines, router trimming machines, high pressure cleaning machines, custom systems. Jet Edge, Inc. US manufacturer of ultra high pressure waterjet equipment for precision cutting, mobile cutting, surface preparation; waterjet pumps; components & accessories. Genesis Systems Group, LLC US manufacturer of robotic arc welding machines, waterjet cutting machines, assembly equipment, robotic tooling systems, material handling equipment. Flow International Corporation US manufacturer of waterjet cutting machines, waterjet surface preparation equipment.